'Tis the time, and while I had very different plans just a few days ago, I am starting this Football Manager with AFC Ajax. It's the club I support, but I haven't managed them since FM14 or 15 or so. They appealed to me a lot because of the transfer business that has been done recently and because I want to get going really. Can't be waiting for some inspiration to hit me! Now, just a few things. while Ajax have spent quite a bit of money, I am super excited about the players at the club at the start of the game so won't be spending much. Probably just a loan here or there. Also, these are my tactics for now. I might be going into more detail later, but let's just say I was inspired by some other FMCU regulars for that last one. Generally that should be the main home-tactic, while the wing play one might be used more for away games. The Wingback one is mostly just there to get a third tactic in there if the first two don't work! Best of luck here. Plenty of young talent to work with, which will make this save an interesting and fun one to watch develop. Should be fun to manage those great prospects. Interesting formations you came up with Good luck! This is just the u-19s. Haha, the strikerless was my creation but the other two the game came up with as suggestions for my style of play in the new tactical creator thing they have now, although I did adapt them a bit to my own liking! Well, we are predicted to finish first after a miserable four seasons in a row finishing second. Not too strange with the squad we have, although PSV should be another contender for sure! As I alluded to above, I am not planning on doing too much business. I got in Mangala as a rotational defense option and Granero as a rotational AMC option in the strikerless tactic as that seems to be working the best! 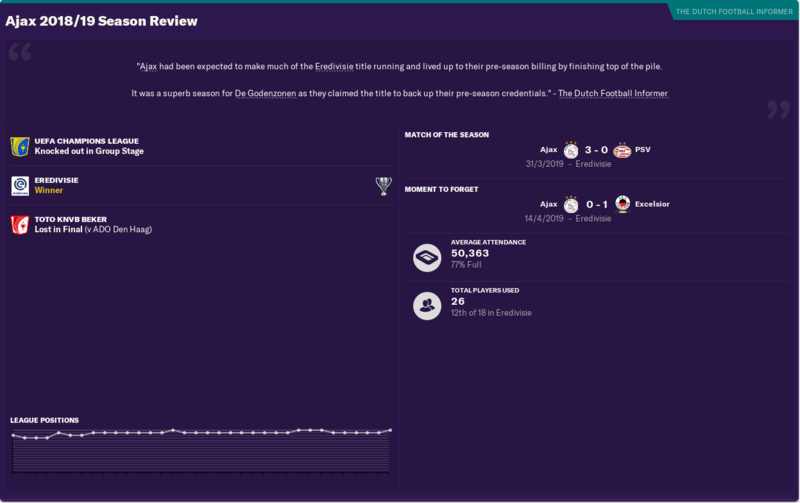 I wasn't manager yet for the Brugge game, so I started FM19 with a 0-3 defeat. 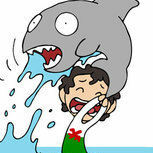 That was a harsh welcome to this game! Fared better against weaker opposition with the "wing play" tactic, but I tried the strikerless approach again against PAOK and most what followed, as it really seemed to work, dominating matches. We managed to get through three CL qualifiers in a row, and beat Kyiv just like in real life to qualify for the groups. Decent start in the league as well, not conceding any goals, but when it comes to attacking we need to be more deadly. Look at that, the exact group PSV have been drawn into in real life. Not exactly what I was hoping for either! Liking the game and the start to this career so far, so on we go. could you post some screenshots of the best prospects/players if its not a hassle? This guy is one of the biggest Dutch talents, he's my profile pic as well. This guy is also insane in real life, really looking forward to how he develops. Versatile! As far as the really young guys go this is probably one of the more exciting ones. If you want to see anything or anyone else let me know. Well, the results are mostly there, but we are far from convincing. Just like in real life PSV just keep winning! Following because it's Dutch and it's the beta of the new game etc. I have him training as an amc-advanced playmaker right now, but he could definitely work out as a winger as well now that you say that! Cheers. Thanks for the screenshots. De Jong's positioning seems off. I mean if he switched between CB and DM for most of his young career, then his positioning has to be better. Yeah, good shout that. Even if I am using him as a central midfielder that attribute needs a big increase for him to become world class. Still not super convincing but at least we are getting the points, not too bad in the Champions League either so far even if we haven't won a game yet. This is the way I'm set up so far, I'm still tinkering with it though. This is an interesting new thing for player interactions, my captain Daley Blind comes to me at times because he thinks players are about to moan about something and sometimes it does a great deal of good to talk to them then, case in point. Brexit happened, not super relevant for this save but could have some repercussions. Still the tiny wins in the league and outplayed in Europe... we will be finishing fourth in the group. 16 goals scored and 3 conceded after 13 games. May I remind you that I play with a "positive" approach! 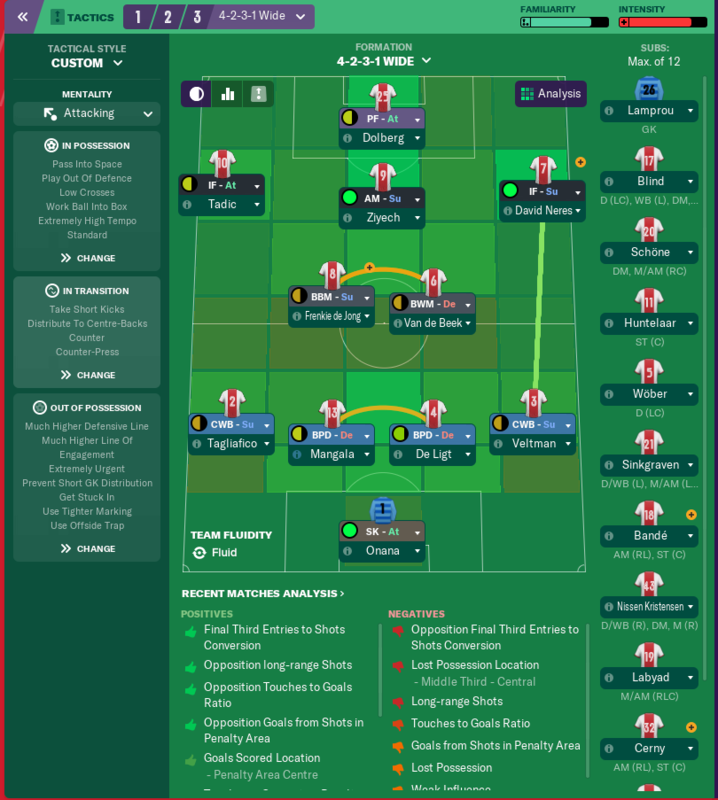 the "wing play" tactic I used at the beginning of the season never really worked, so I replaced it with a more attacking tactic with a familiar formation (to me) based on the Gegenpress settings. One of the big downsides, though, is that it doesn't really fit some of my best players including Frenkie de Jong. Hopelessly last, the other three teams were too much of a match for each other. Us and PSV really going at it, and to be fair Feyenoord are on a run now as well. Also I got this message, interesting... it hasn't been completed or cancelled at the end of the month though, which is a bit annoying as the transfer market has opened. As far as the game world is concerned, Griezmann has won the Ballon d'Or, Philippe Coutinho the world player of the year (!) and Mbappe won the Golden Boy award. I'm gonna take a bet and say Barcelona will win the EL without a sweat. Decent December mate! And I love how defensively solid your side looks (only 1 goal conceded in 6). Keep up the good form and you will be top of the league soon! Haha yeah that was my first thought as well. Cheers! Yeah, it's kind of surprising to me as I was not necessarily aiming for a bunch of 1-0's. Well, the takeover didn't "take", if you will. At least I could get to some transfer business. As I sold Huntelaar. The free departures were players whose contracts were ending at the end of this season, a bunch of clubs came in for them, I guess that's something the AI does now. I tried to put some future sale-on percentages in but they wouldn't agree to that. Oh well, at least I don't have to pay their wages. Kristensen was back-up right back and not a great one, I was surprised they came in for him. Well, mostly playing the new gegenpressing style tactic isn't really doing much more for scoring goals but the results are good! Title race might very well be going to the end. The first 100m+ transfer in my save. Be interesting to see if it'll happen a bit more or about the same as last year. You're not too far behind PSV, which is good news I suppose! It seems to be a two-horse-race for the title; as I can't see both yourself or PSV slipping up too much to allow Feyenoord an opportunity. Shame about the Champions League, but when you're in a group like you were; it'll always be tough to get the results. Yeah, it should definitely between us two. I just wasn't ready yet for CL football, perhaps next season when I have a better idea what I'm doing, hopefully. Look at this, perfect couple of wins - not the hardest of months to be fair, but this is looking very good. I'm honestly shocked with how few goals I am conceding, it's not like I had this kind of masterplan for defense. I guess it helps having players like De Ligt. 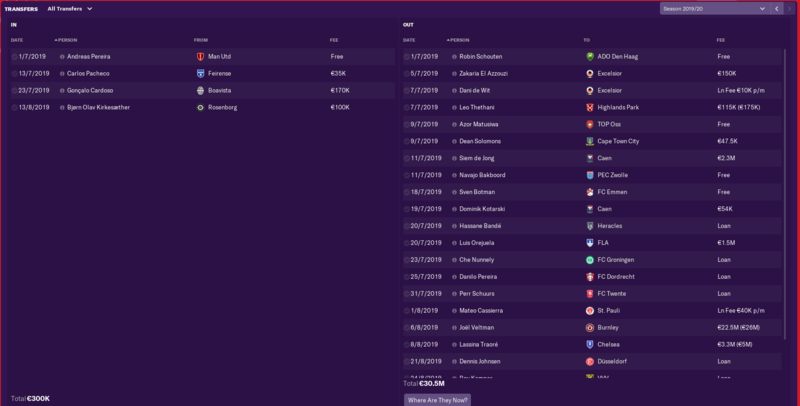 March 2019 + First Youth Intake! ?! All of a sudden we are scoring and winning big! Dolberg started scoring, and others followed... to the final of the Cup and most importantly beat PSV at home, convincingly at that. What a bizarre season it has been so far, but not taking the title for granted quite yet. I was hoping a bit more - there doesn't seem to be any world beater here, although you never really know. I signed up almost all of the youth players except for two with bad perceived pa, bad personalities and low determination. Remarkably there is a model citizen here already, I don't think that used to happen much with regens out of the box! Also two 'fickle' players, perhaps the more uncommon personalities are a bit more common now. Any chance that Paul Fosu-Mensah is a relation to Tim Fosu-Mensah? Ouch, that was unexpected. We did dominate those matches, but we could've really used some more points... happy to get back to form though. The bad news, though, is that it might just be too much. We play Utrecht at home, while PSV face AZ away. Won't be easy for both of us. But face I'll have to play a cup final. Let's win some trophies! Ouch, we just couldn't do it in the final, so we needed AZ to help us against PSV in the last match to get anything from this season. We won the title, incredible. Scenes! And not only that, the reserves also won the title in the second tier, taking first spot on the last match day as well!! 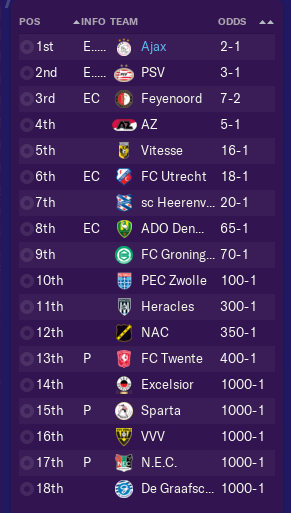 Most of the season in second but just managed to overtake PSV in the end. Bizarre season where I didn't exactly know what was going on with the tactics and stuff, only conceding 10 in the league but not scoring anywhere near as much as I like to see either. The CL went to Liverpool in a bizarre final, with an extra time hattrick from Adam Lallana. Absolutely brilliant way to win the league title! Some huge wins on the way to claiming it, but two draws over the season to Emmen - it seems you've found your bogey team. Congrats on your win, but great to see Kobenhavn win the league ahead of Brondby. Great day for football all around. How'd Newry go in the NIFL Premiership? Congrats on taking relegation candidates to the title by the way! Hope you don't suffer from second season syndrome. Haha cheers, I'm thankful they got relegated then! Predicted to win the title again, of course! Well, an interesting transfer summer. As I showed you before, there were a lot of players at the club, a bit too much for my liking. 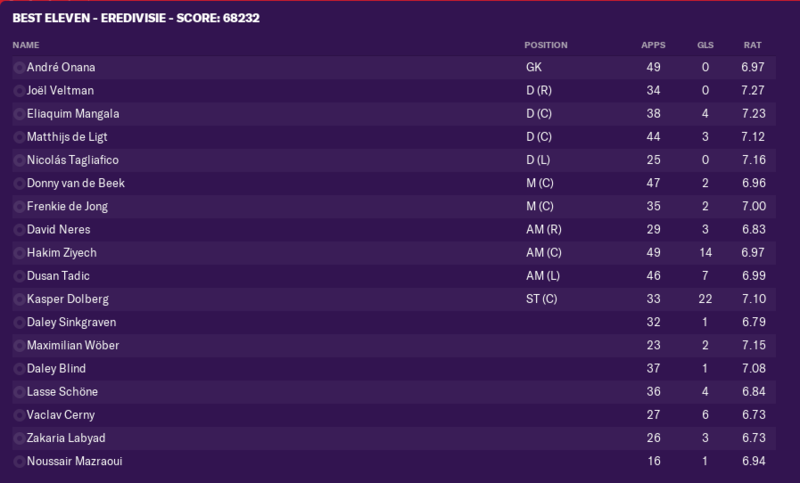 So I sold some of the weaker players or let them go for free, while I was looking for players that were more or less in between the B team and the first team to get a loan spot elsewhere. The one big transfer is Veltman, while he's a good player I thought the offer was just really good and it would be silly to refuse it. I also let go Traoré, a talent but I'm not sure if he's going to be the level that Chelsea sees in him. As far as the incoming players I signed Andreas Pereira for the first team as an option for the midfield or the left wing, while the other three are talents that I was able to pick up for cheap. I had the budget to spend more but I don't think that's the way I want to go for this save, if I'm going to buy it's going to be young talents without any crazy price tags attached to them. I completely went for the gegenpress-style tactic and this is the result. I don't know if it's because the players have developed, have better team cohesion, or if it's because I really focused on one tactic this season, but the difference between this and last season is huge. So many goals! 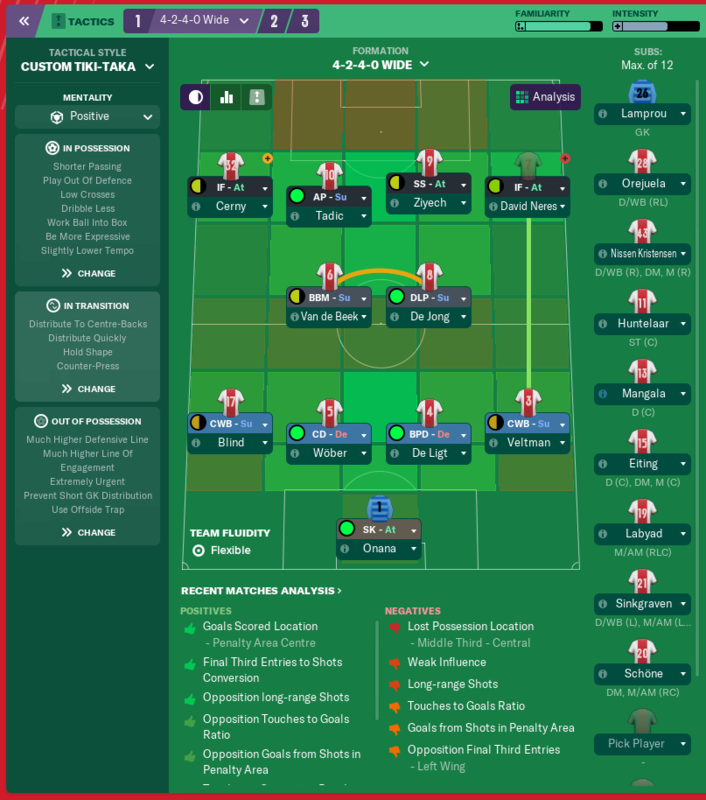 I'm starting to think now that the tactic is OP, but it might also be just that I have much better players than the opposition faced so far (whell, that should'nt have been the case against Monaco but as that was a pre-season friendly...). Whatever the case may be, we are dominating so far. Good to see Dolberg scoring tons, but also Arabidze, who I signed last january. Of course we are in first, with a lead of 4 points on PSV already - and Feyenoord are on zero! The CL group is tough again, with PL winners Man City, EL finalists Milan and Portuguese league winners Porto. A good test to see where we really stand. There have been two 100m+ transfers this summer, remarkably it seems like a bit of a trade between Liverpool and Real Madrid. But Newry do play in the highest league of Northern Ireland since this season. Good start in the league, I see some chances in the CL too, especially against Milan and Porto. At least that makes my struggle with Newry seem more forgiveable, despite it being two levels lower. Nice save! Really enjoyed my time in Holland last year. Wish I had started there. How is kik pierie looking so far? He turned into a machine in my save last year. Eventually i sold him to Bayern for 30 million. Pierie is still looking very good - I had thought about buying him for 7.5M, but as I already have a bunch of defensive talents I decided not to. He moved to Mainz instead. Defeated for the first time this season by Man City, after we weren't able to beat PSV either. Slightly disappointing, but we got back to winning ways quickly. Not too sure what PSV and Feyenoord are doing so far, although it looks worse because they've played a game less. Nice going from Heerenveen so far. Wow, not conceded any goal and the first win in the CL groups in this career! Great save so far! What's your plan with Europe going forward? Long term strategy to win the UCL or just focused on dominating Holland at this stage? 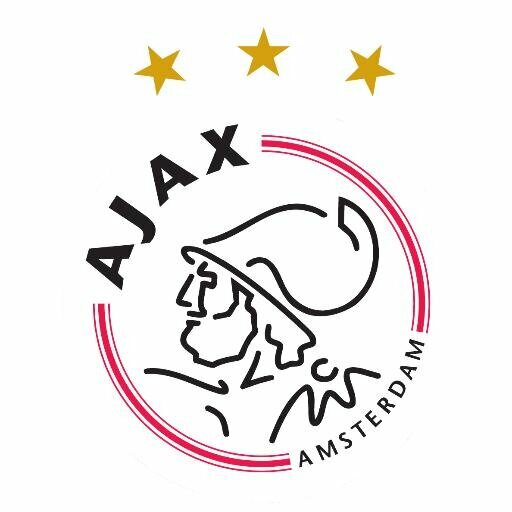 Awesome stuff, always enjoy an Ajax career, seems like it's now going swimmingly on track although you did win the title on season 1! Ideally both... right now it's just about trying to strengthen the team and club consistently, by investing in young talents, keeping star players like De Ligt by offering them good wages etc. The long term goal has to be to win a CL, it's always hard to judge how long that will take though. I am curious to see if any AI-managed teams can keep up with us in the long term, it would be good to see the Dutch clubs making a step forward collectively. Thanks! This season it feels much more comfortable than the last, so yeah going well. I'll be looking forward to your thread then! Very good in the league, although the game against Man City brought us back down to earth, great difference in quality shown. PSV doing well now, but Feyenoord still mid-table.